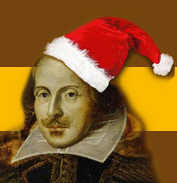 Shakespeare Orange County invites you to join them for A Shakespearean Christmas – A Midwinter Night’s Dream on December 17, 2011 at 8:00 pm. Join your friends and celebrate the holiday season with a joyous, poetic, humorous and touching taste of Yuletide Cheer. This warm and evocative remembrance of years past will include songs and poetry, notions and stories of a simpler time. Enjoy such stuff as dreams are made on through the eyes of Shakespeare, Charles Dickens, Clement C. Moore, Robert Frost, e.e. cummings, Ogden Nash – along with traditional carols and personal remembrances. And following the performance, stay for a variety of desserts and complimentary Champaign, hot cider and other treats. The evening will feature John F. Jones, Gil Gonzalez, Evelyn Carol Case, Craig Brown, Gene Godwin, Amanda Zarr, Stephanie Robinson, Mike Fountain, Greg Ungar, Brian Clark, Eve Himmelheber and Michael Nehring. Click Here for more information.